St Leonards Sixth Former Alex Campbell (Year 13) travelled to Antarctica during the Christmas holidays in support of the UK Antarctic Heritage Trust, an organisation which works to keep the history of the British Antarctic explorers alive. Alex flew for 16 hours and sailed for seven before reaching Port Lockroy on the frozen Antarctic Peninsula, where he was briefed, along with his brother Harry and sister Catherine, both St Leonards Seniors, on the wildlife, including penguins, whales, elephant seals and many different species of birds. After learning about the topography of the land that lies beneath the ice, Alex discovered more about how this land helps to form the glaciers and ice shelves that are found all over the continent. There were strict regulations to comply with even before Alex and the rest of the expedition team embarked from the boat, including vacuuming every item of kit using a powerful suction tool to prevent any foreign soils, seeds or bacteria from entering the Antarctic zone. 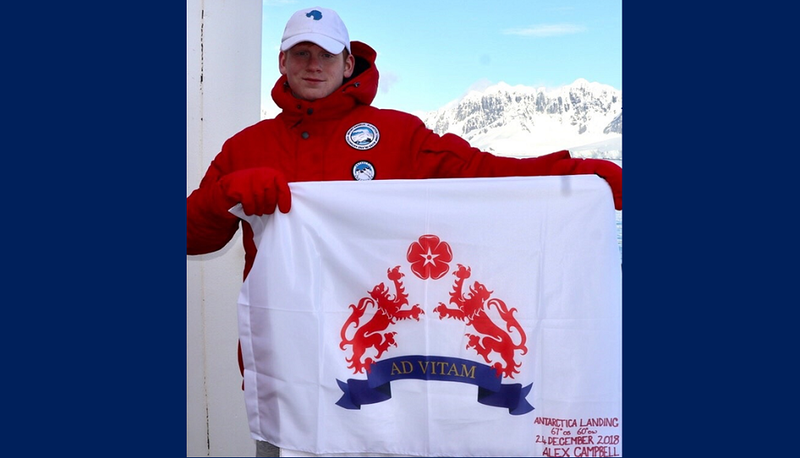 Over the course of the expedition, Alex attended a lecture by crew members of the American Scientific Research Team from Palmer Station on the realities of living and working in Antarctica for six months of the year, and even raised a St Leonards flag, which he had brought all the way from Scotland to represent the school. Alex said: “Just to see the Antarctic Peninsula made all the hours of plane travel and several days at sea worth the hardship. The breathtaking landscape and incredible wildlife creates a picturesque scene to rival the natural wonders of the world. An absolutely incredible educational adventure completed by Alex and his family!